If one punch can change a career then this is as good an example as any… after all, Stevenson is a contender for Rise of the Year while Dawson is a contender for Fall of the Year. The lightly regarded Stevenson turned himself from a fringe contender at 168lbs to consensus champion of 175lbs with one perfectly placed straight left to the jaw of the favoured Chad Dawson. While Dawson did make it to his feet it was clear that while the lights may be on there was nobody home. Some KO’s recall other great KO’s and this one had more than a whiff of Julian Jackson vs. Terry Norris about it. Prospect Teper backs the teak-tough Rogan to the ropes through pressure, lands a right that stuns him, a few follow up punches that put him out of his feet and a crushing final right that sends him tumbling to the canvas with a broken jaw and likely retires Rogan. It had been a quiet few years for the once highly regarded Daniel Jacobs, with personal tragedy, a knockout loss to Pirog and serious medical issues keeping the contender out of the limelight. But he reminded us exactly why so many people thought so highly of him with a devestating knockout of the durable Lorenzo. Lorenzo had never been stopped despite taking on a number of contenders and champions but he stood no chance against Jacob’s aggrssion, power, athleticism and combination punching. I may have thought Golovkin largely wasted this year when you compare his talent to who he’s beaten, but the manner of those beatings (and beatings they were) was pretty entertaining. Ishida may have been semi-retired, but he has always been tough to hurt, let alone stop but an overhand right following a glancing uppercut knocked him unconcious. 2013 was a year of highs and lows for Matthysse. Stopping Lamont Peterson was clearly a highlight but losing (arguably for the first time legitimately) to Danny Garcia was a low. Before both those bouts however, Matthysse kicked off the year by flattening the limited Dallas Jr in only a round. Watching live it was hard to tell exactly what knocked Dallas Jr out… but the end result was clear, Dallas Jr face first on the canvas unconscious. Penalosa Jr has 12 wins and 11 stoppages so he’s clearly poweful, even though the opposition the second generation boxer has faced has been pretty weak. The level of opposition doesn’t take away from the beauty of this stoppage though. Sithsaithong was coming forward and actually having a decent level of success, buzzing Penelosa Jr before the Fillipino stopped him in his tracks with a counter hook and then finished him with a sickening body shot that left him face down on the canvas unmoving. Gennady Golovkin vs Matthew Macklin: It’s always hard for a body shot KO to compete with a headshot, but this one was beauty. After beating up Macklin for a few rounds Golovkin finishes the show with a hurtful punch to the ribs. Tyson Fury vs Steve Cunningham: Fury had already visited the canvas himself early on against Cunningham but despite looking sloppy he started to take over the bout using his size and power to bully the former cruiserweight title holder around. He ends it with a chopping overhand right when Cunnginham was trapped on the ropes. Joseph Parker vs Frans Botha: 21 year old new Zealand prospect Joseph Parker picked up the biggest win of his young career by destroying the veteran Botha, forcing him to the ropes and destroying him with a hateful series of punches. Jorge Heiland vs Billi Godoy: They’ll be more to come on this bout but in an engaging toe to toe contest, Heiland takes the victory with a dramatic last round stoppage. Jeff Horn vs Samuel Colomban: First round, one punch, out he goes. Pretty much perfect. Milan Melindo vs Tommy Seran: Ever since Zab Judah broke into the chicken dance against Kostya Tszyu boxing fans have always loved a KO where a boxers legs go wild. This years entrant comes from Melindo, who sent Seran down with a sharp counter left hook and then watched on as Seran danced his way to a stoppage loss. 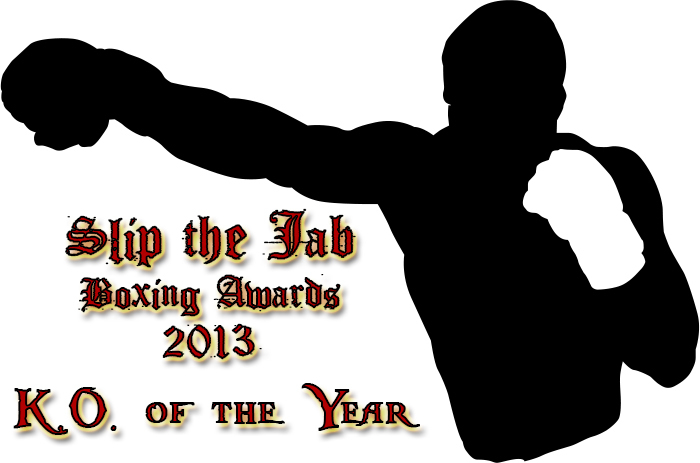 This entry was posted in Analysis, Boxing, Slip the Jab Boxing Awards, Slip the Jab Boxing Awards 2013 and tagged Adonis Stevenson, Billi Godoy, Boxing Awards, Boxing Awards 2013, Boxing End of Year Awards, Boxing End of Year Awards 2013, Chad Dawson, Daniel Jacobs, Dodie Boy Penalosa Jr, End of Year Awards, End of year Awards 2013, Erkan Teper, Frans Botha, Gennady Golovkin, Giovanni Lorenzo, Jeff Horn, Jorge Heiland, Joseph Parker, Lucas Matthysse, Martin Rogan, Matthew Macklin, Mike Dallas Jr, Milan Melindo, Nimithra Sithsaithong, Nobuhiro Ishida, Samuel Colomban, Slip the Jab Awards, Slip the Jab Awards 2013, Steve Cunningham, Tommy Seran, Tyson Fury by consortium11. Bookmark the permalink.